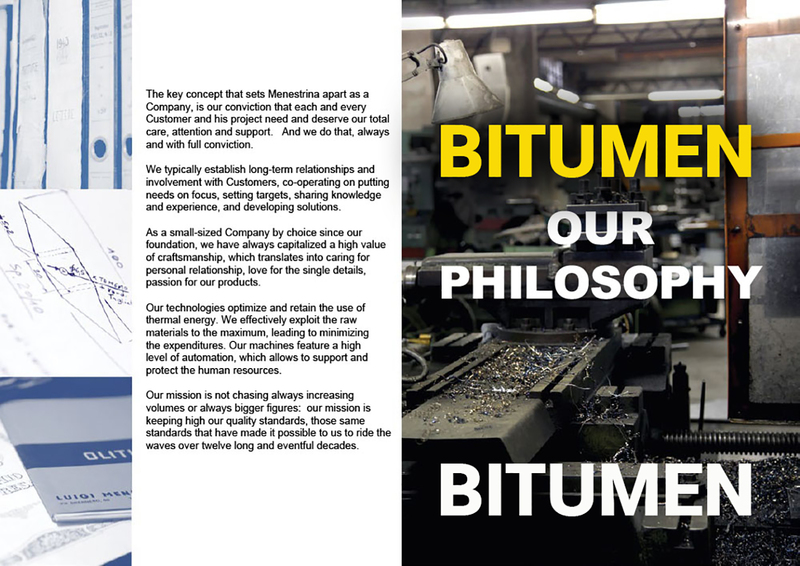 At Menestrina we can truly say “We speak bitumen”, as it is in fact since the twenties that we deal with bitumen processing. emulsions, Menestrina can provide reliable machinery and equipment backed by a huge wealth of experience. we can provide all what is necessary to assembly a suitable production unit tailored to the specific Customer’s requirements. As the logic complement to the main equipment, Menestrina manufactures its own comprehensive line of components specifically engineered for bitumen, as large heated basket strainers, 2way and 3way heated valves that can be either manual or servo-controlled, level bubblers, samplers, etc. The key concept that sets Menestrina apart as a Company, is our conviction that each and every Customer and his project need and deserve our total care, attention and support. And we do that, always and with full conviction. We typically establish long-term relationships and involvement with Customers, co-operating on putting needs on focus, setting targets, sharing knowledge and experience, and developing solutions for bitumen. As a small-sized Company by choice since our foundation, we have always capitalized a high value of craftsmanship, which translates into caring for personal relationship, love for the single details, passion for our products. Our technologies for bitumen optimize and retain the use of thermal energy. We effectively exploit the raw materials to the maximum, leading to minimizing the expenditures. Our machines feature a high level of automation, which allows to support and protect the human resources. Our mission is not chasing always increasing volumes or always bigger figures: our mission is keeping high our quality standards for bitumen, those same standards that have made it possible to us to ride the waves over twelve long and eventful decades.